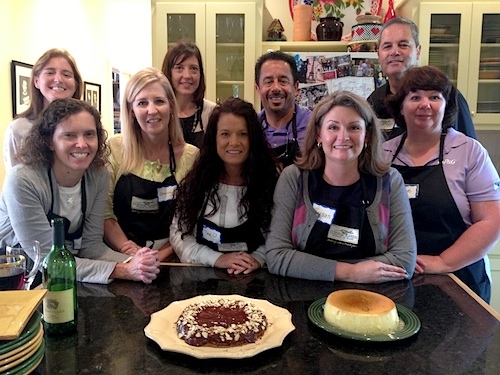 The concept: Your group will be welcomed to the Provençal-style home of Karen Gros in Eureka Springs, Arkansas where French Culinary Instructor, Karen Gros will guide and assist with the preparation of a 3-course seasonal menu. Together, you’ll prepare the meal from start to finish, set the table, present & serve the meal. Finally, you will contemplate and savor your creations during a sit-down luncheon. The meal concludes in the French style with a cup of coffee and square of dark chocolate served after dessert. Everyone then pitches in for a quick cleanup. Groups of up to 12 participants may be accommodated for a Culinary Team Building event. ExxonMobil prepared Kale Caesar salad with homemade dressing & croutons, local pork shoulder roast braised in white wine with bay leaf & sage. Here, they display their dessert, Vacherin (French meringue layered with whipped cream, raspberry sauce and fresh market peaches). Procter & Gamble prepares brandade de morue (creamy baked cod mousse), daube (slowly braised beef in red wine with carrots, onions, and olives) served with French buttercream potatoes with olive oil & parsley. The group topped the day off the two desserts, featured here: Flour-less chocolate almond cake with chocolate glazing and flan with vanilla bean and caramel glaze. 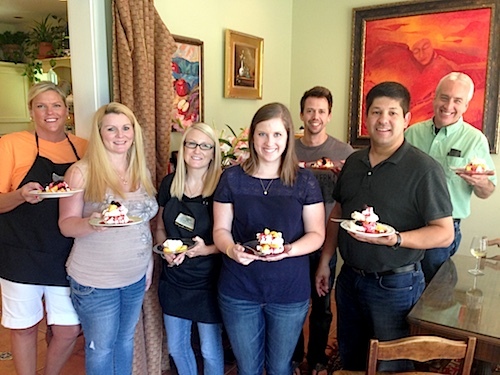 What to expect: The Culinary Team Building event will take place at our in-home facility in Eureka Springs on a designated weekday, from 10:00am – 2:00pm. The timing allows for approximately 2.5 hours prep/cooking time and 1.5 hours of dining/social time; your group may stay on the premises until 3:00pm for additional enrichment activities, if desired (to be organized and facilitated by your group organizer). The program will begin with a brief, but important orientation, including safety lessons, use of equipment, and basic knife skills. The menu, as well as the sequence of events and timing of each dish, will be discussed. Freshly brewed coffee will be served, and teams will then begin preparation of the meal, employing their assigned tasks. Everyone will play an active role. Team members will find themselves chopping, sautéing, mincing, whipping, measuring, folding, preparing the table, and/or washing the dishes. When all is ready, relax together and enjoy the wonderful meal. In keeping with French tradition, your group will be served a 3-course menu comprised of: starter, main dish, and dessert. An optional wine pairing is offered and includes one glass of wine specifically chosen to complement the main dish. Prices: Contact us for pricing and terms.